Luxury 3000sq.ft 5 bed/3 bath beautifully furnished executive Disney villa with large private SOUTH-WEST facing pool on prestigious Highlands Reserve Golf Course. Only 10 minutes to Disney, Games Room, and Wi-Fi. This 3000 square ft fully air-conditioned villa has 2 master bedrooms and 3 twin bedrooms each equipped with a TV set is ideal for two families to share. This luxurious villa is located at prestigious Highlands Reserve Golf and Country Club, just a few miles from the entrance to Walt Disney World, MGM Studios, Epcot and all other Disney parks. 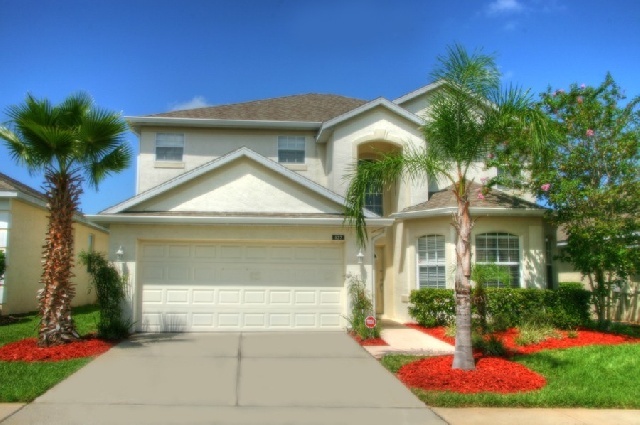 Situated to the West of Kissimmee, Highlands Reserve gives easy access to Highway 192 and Interstate 4. The ground floor comprises of a large family room beautifully furnished with leather sofas and a TV. Dining area equipped with a gorgeous table seats six is directly adjacent to beautifully furnished formal living room. There is room for 10 in the living room and 12 in the dining room. The fully equipped kitchen has everything you need. To prepare food you will find a cooker, an oven, a microwave, a fridge, a freezer, a kettle, a toaster. You will also find a dish washer, a washing machine, a clothes drier, an iron and ironing board. Also provided cutlery, crockery, glassware, cooking utensils. Thru the sliding glass door you will enter large fully screened pool area. After a relaxing swim in the South facing pool in you can find refuge from heat in a covered Lanai where you will find a table and comfortable patio chairs. Or if you decide to take advantage of the Florida Sun you can suntan on the extended part of the deck which is exposed to the Sun all day. 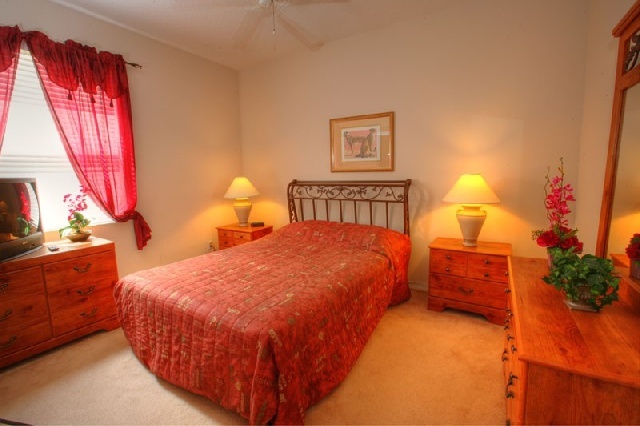 One master bedroom is located on the first floor. There is also a laundry room with full size washer and dryer, ironing board and iron for your convenience. Upstairs you will find a loft with a double computer work station where you can enjoy free broadband internet as well as anywhere in the house if you bring a laptop. Directly from the Loft through a double doorway you will find your way to the Master bedroom 2 with its magnificent King size bed, TV set and En-Suite bathroom. For extra convenience there is a huge walk in closet where you can store comfortably all your luggage away from view. Across the Loft there are 3 bedrooms fitted with twin beds & a TV set. There is a wonderful games room with a pool table and air hockey table. There is none stop entertainment! Included with the rental is local calls, long distance to the US & Canada, high speed internet and wifi and use of a highchair and crib. This is the perfect villa for your next family vacation!